July 31, 2018 / Filed under Blog, Long Range Transportation Plan. To understand why our communities look the way they do, simply look at how we invest in transportation projects. The first communities in Pinellas County developed around railroad stations, resulting in the dense, compact development that still exists today in the downtown areas of Safety Harbor, Tarpon Springs, Dunedin, Clearwater and St. Petersburg. All that changed as the automobile became widely used. People suddenly had more options (other than trains, horses, and walking) to get around their communities. Local governments invested in improving and building more roads as distance became less of a barrier, enabling more spread-out communities to develop across Pinellas County and the broader region. New bridges across Tampa Bay cut down travel time between cities and new developing areas. The advent of interstate highways enabled businesses to choose locations with regional access to so that they could capitalize on passing traffic and also draw employees from a broad area. Suburbs developed into major cities as homebuilders sought cheaper land with regional access. As in the past, the transportation projects that our communities decide to invest today in will influence how Pinellas County and the Tampa Bay region will grow and evolve into the future. Forward Pinellas has a decision-making role in that process – as do you. As a metropolitan planning organization, Forward Pinellas determines what transportation projects should receive state and federal funding in Pinellas County with its long range plan. The plan identifies the major transportation needs for our communities and enables them to receive critical funding in the future – without inclusion in the plan, a transportation project cannot be eligible for this funding resource and may not be built. Forward Pinellas creates a new Long Range Transportation plan every five years, and is in the process of developing that plan now. Along with the MPOs of Hillsborough and Pasco counties, this agency has been working to evaluate how the region could grow depending on a variety of transportation investment choices. 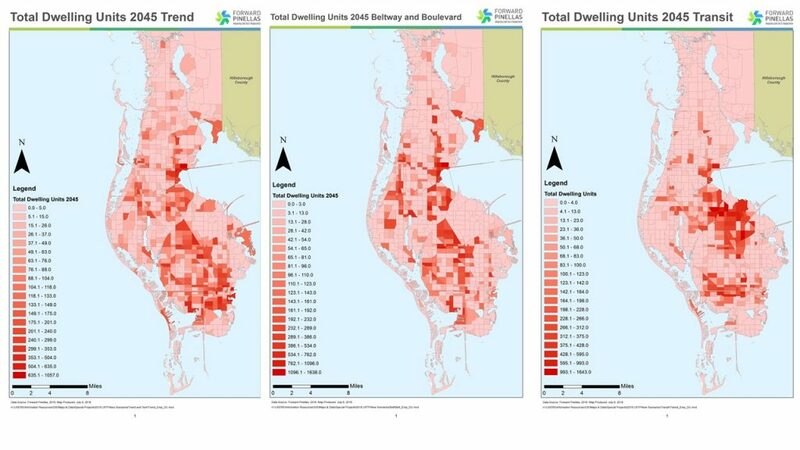 These images show where population growth will be concentrated if we continue business as usual (left), if we make major highway investments (center), or if we invest heavily in transit (right). Our research shows that if our community chooses to invest primarily in major roadway projects, future growth and redevelopment will concentrate in the areas with the best roadway infrastructure. Investing in roadway projects encourages land development to reinforce automobile travel, meaning more space is needed for parking, and walking, bicycling or using transit becomes more difficult. Rural areas will continue to develop, and agricultural lands may be lost. If the county and region choose to invest in mass transportation projects, new growth and redevelopment tend to cluster around transit stations because people and employers value the access those stations provide, and many will be able to leave their cars at home (if they own cars at all) and take transit and walk to their jobs, retail and recreational destinations. A more developed transit network will preserve rural areas by focusing new growth in more compact, walkable places. Here’s where you come in. We need your feedback to develop recommendations about how we should spend our limited regional resources on the transportation projects that are important to you and how you would like to see the Tampa Bay region and your community grow. The responses you provide to this interactive regional survey will help us develop a list of projects that will be considered for future funding and will help shape the way our communities develop, and redevelop, for years to come. The TIME is now. The vision is yours. For the students and graduates of Pinellas Technical College transportation is a major concern. Please contact us to discuss an opportunity to host a community meeting on our campus.